I posted the details in my notebook on Ravelry (my username is PaulineOS). 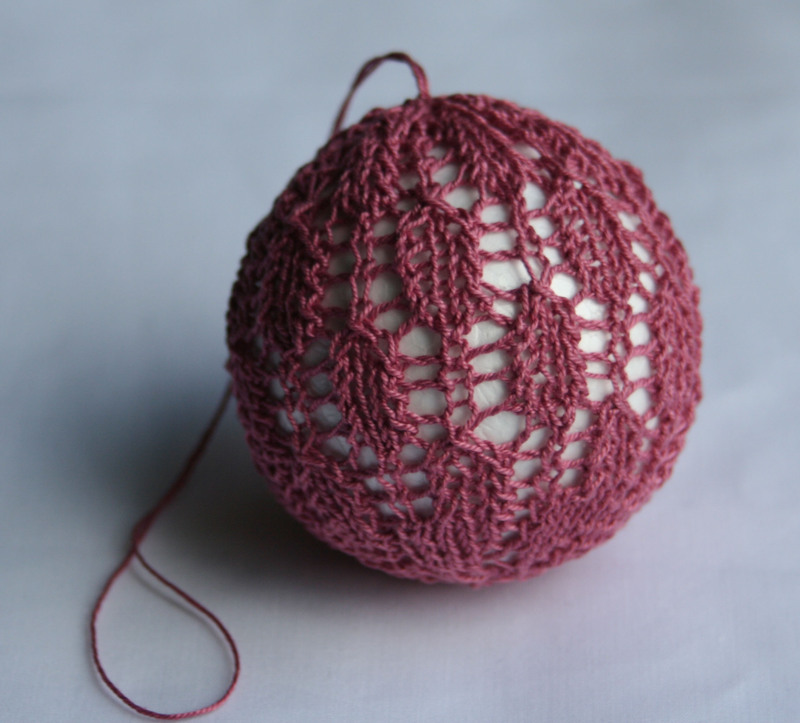 I thought I had enough purple lace weight yarn to complete it, but when I checked, oh horrors, I was one ball short! Day 1 (Friday 26th) Team TIK was planning to meet in the Powerscourt townhouse centre for the official casting on ceremony in the evening. All I had to do was find another ball of purple, or enough skeins of another colour to make the cardigan, and 1500 beads to match! 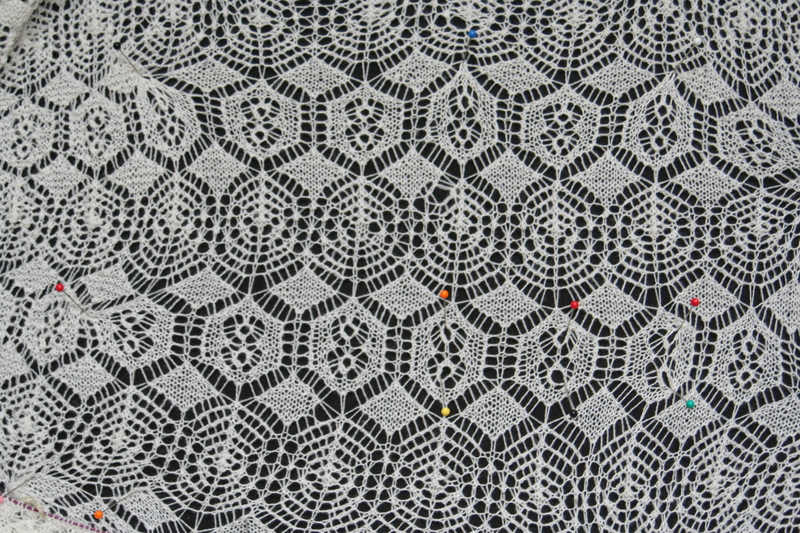 Off I zipped on the bus to my best source of silk-alpaca lace weight, The Constant Knitter. 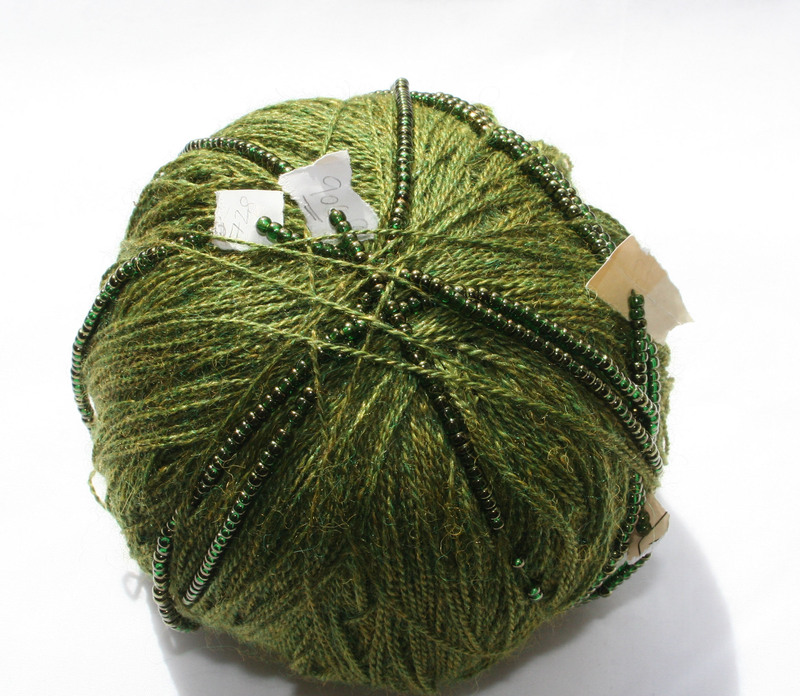 Oh joy, not only did Rosemary have sufficient yarn (Drops), she also had my favourite colour, moss green. Another bus to Bachelors Walk on the quays to the Yellow Brick Road Bead shop, where I acquired some truly luxurious bronzed green beads. I gather the word bronze is on the USOC hit list but tough! The word bronze was there long before them, and as for the Olympics, don’t get me started….! Delighted with myself I bussed home with my goodies and set to winding the skeins with the help of my son Pinball. I must admit I am a bit nervous that I have bitten off more than I can chew. 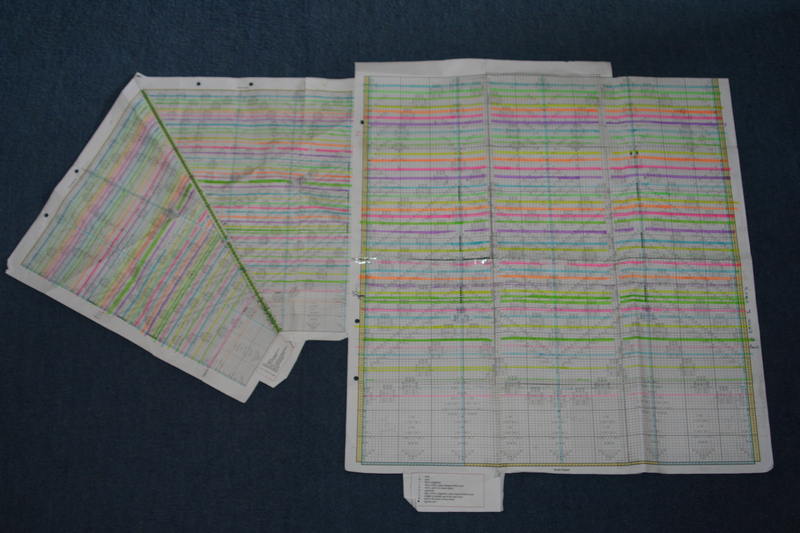 This pattern as you can see is really complex. I know we’re meant to stretch ourselves but seventeen days is starting to sound like a very short time. I have managed ten rows on the sleeve (little gold pin, below right) and am more than ready for bed! Day 2 (Saturday 27th) Crisis for breakfast! I have just discovered what I think is a mistake in the chart on row 22. 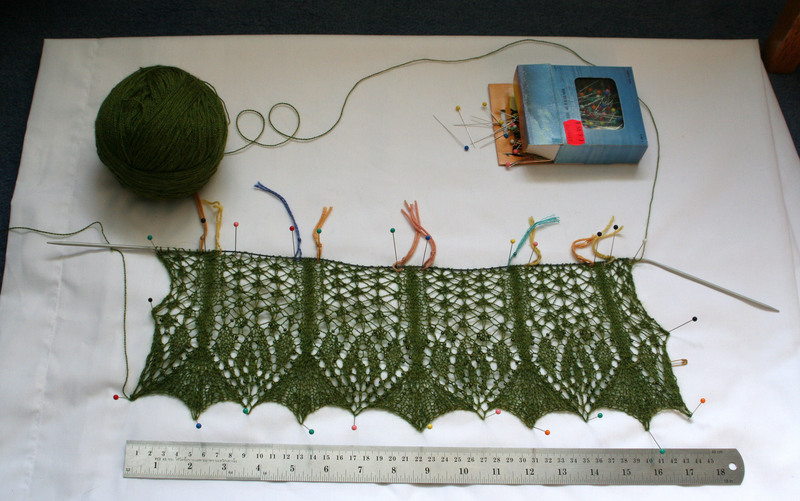 A frantic search on Ravelry reveals that one other knitter has started the Monet cardigan. I fire off a panicky query, but she is presumably still asleep in Arizona. 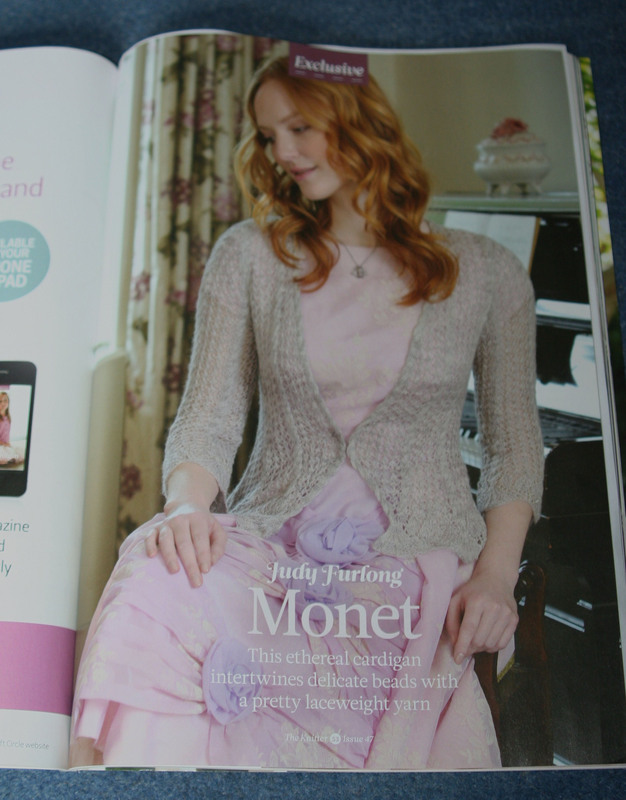 I can’t get onto the Knitter website, aargh!. “Calm down,” says Pinball to me, so I start using my head and figure out a likely solution. A few rows later I realise that this is going to be a dreadfully wide sleeve. The one time I’m in too much of a rush to swatch, and I get my comeuppance! 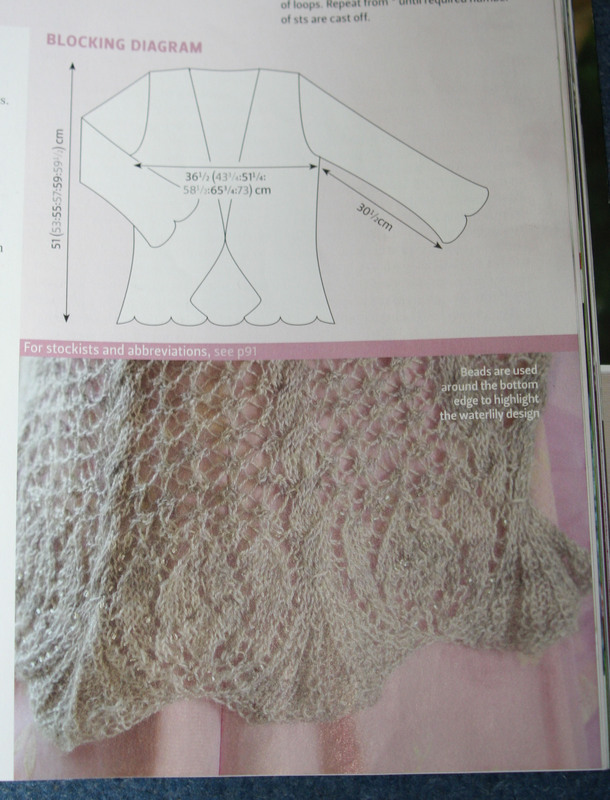 That’ll learn me… I’m going to have to rip this and knit a smaller size, but I can’t face it now. Breakfast time in Arizona brings me a kind response from Biciturista: perfect timing! Deep breath. I cast on 400 plus stiches and get stuck into the main body. 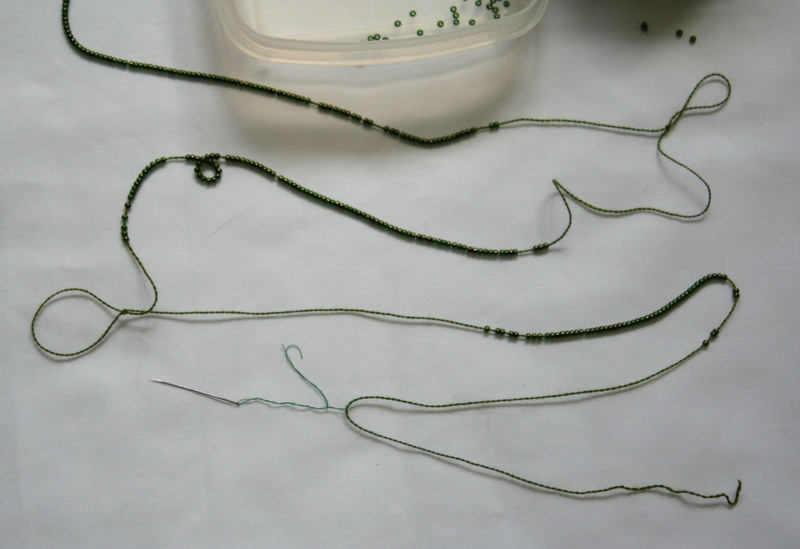 There are nearly a thousand beads on this thread and I’m starting to hate each one individually. They have to be pushed down the yarn over and over and over again as I knit. No amount of pretending that I’m doing stretching exercises can make this any less than tedious. This is the first time I can remember that knitting has felt like hard work. When Pinball remarks on my bad humour I decide to call it a day. I have managed ten rows. Day 3 (Sunday 28th) Yesterday really was a bad hair day. I really am not usually that cranky! All that rain probably didn’t help. Starting in today I feel as if the worst is over, because I’ve used up so many of the beads already. I can see the slinky bronze trail, which is stretched out on the couch besides me to take the weight off the actual yarn, getting shorter and more manageable with every stitch. I can do this! Day 4 (Monday 29th) Whee! Finished the beading last night, accompanied by Star Trek. Stitch count has reduced by almost a quarter too. Time to sign out and get back to my now quite loveable project again. P.S.The sun is shining, it must be summer after all! 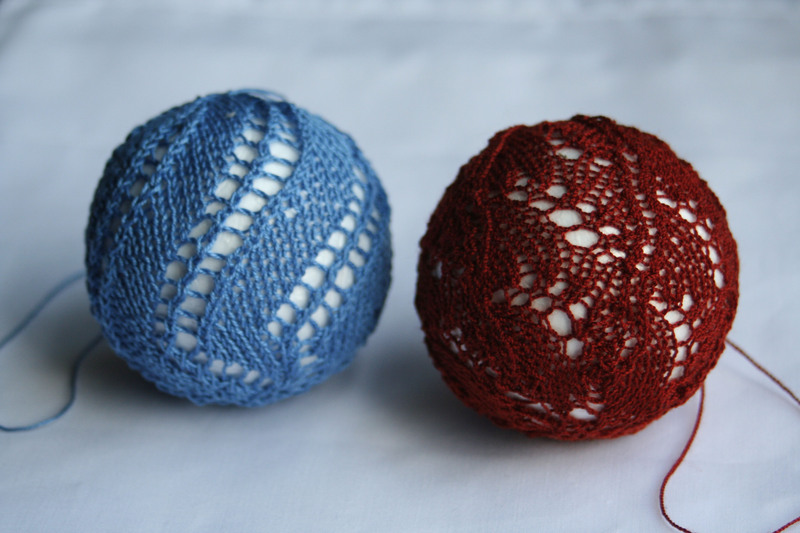 The idea is to have a lace ‘jacket’ over a bog standard Xmas ball, letting the original colour shine through. For my prototypes I’m using some polystyrene balls found on sale in a local stationery shop. 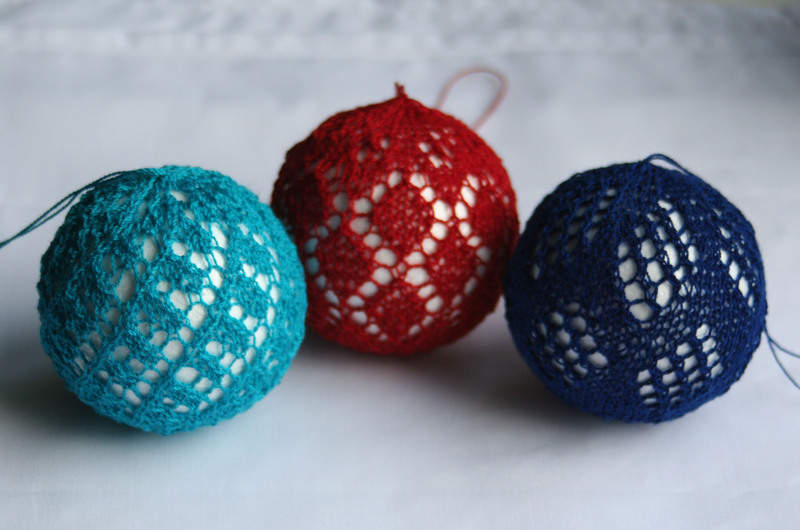 They’re about 7cm/2.75 inches in diameter, so they’ll do for practice. I’m doing some in in crochet cotton no. 10 (below left, 565m/613yds per 100g), and some in the acrylic (below right, ~700m/100g). Figuring out the right no. 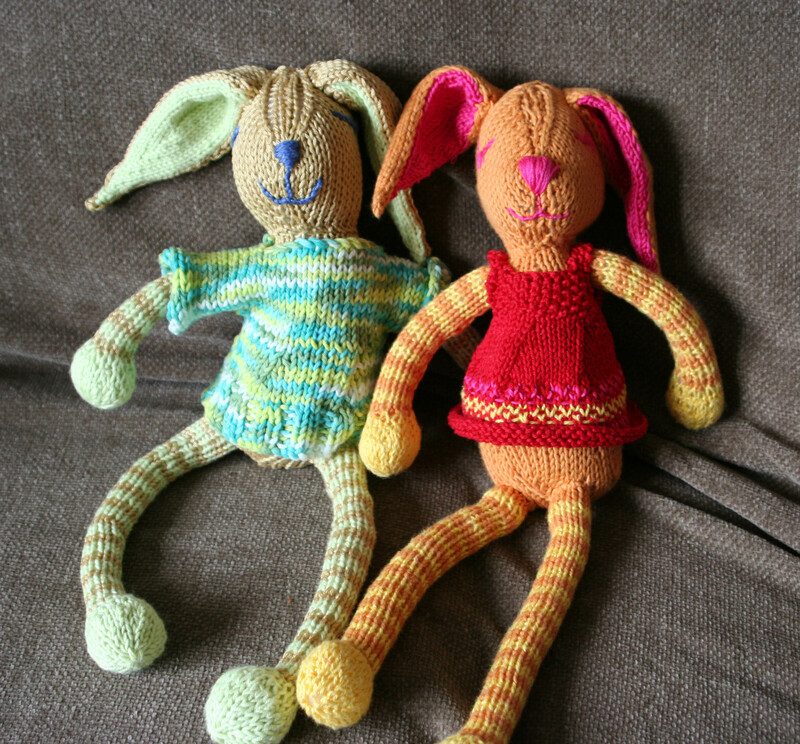 of stitches and repeats for each thickness certainly has distracted me from the rain! Pleasant surprise: although Susie’s been through 7 months of chewing and teething, she’s not showing the mileage (I brought my darning gear to the party, just in case)! 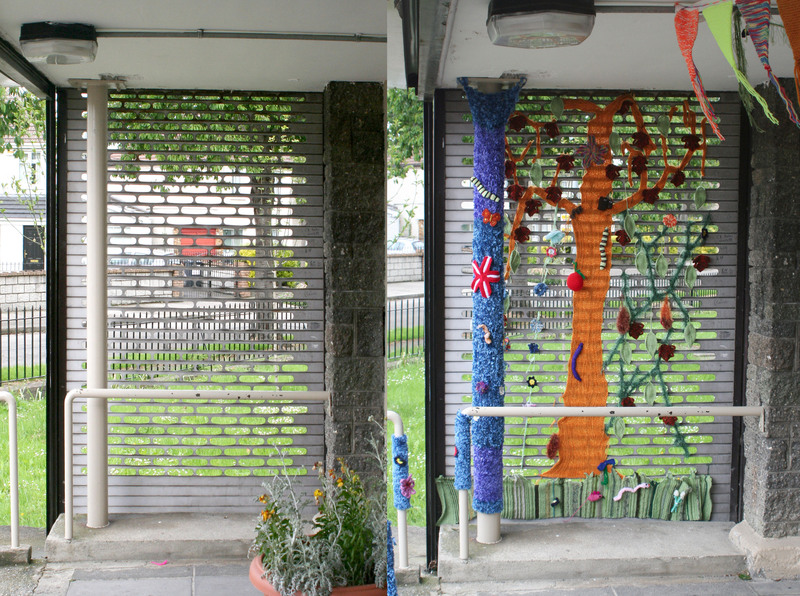 Two and a half years ago I came across a project by the Ravelry Heirloom Knitting Group. 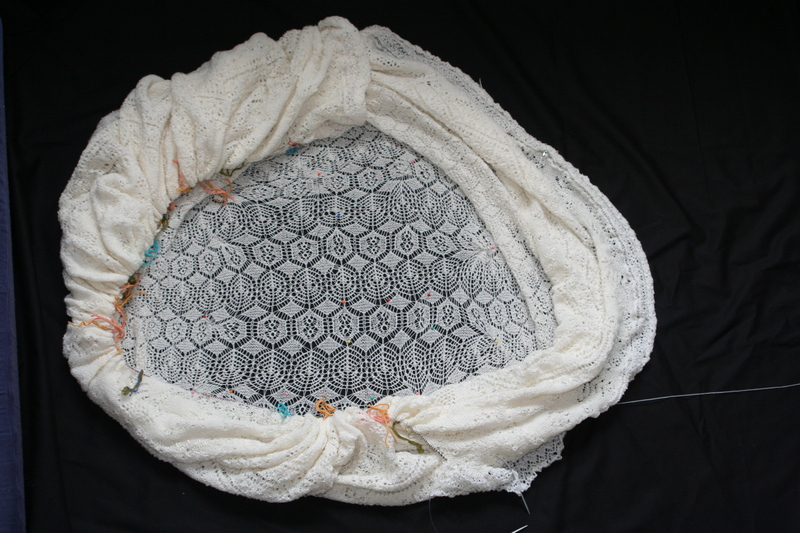 They had painstakingly reengineered the Queen Susan Shawl Pattern from a photo of the original and then made it accessible to all. It was love at first sight! Being semi-immobile at the time thanks to chronic joint pain, I was thrilled to have a big challenging (i.e. distracting) project and got stuck in. 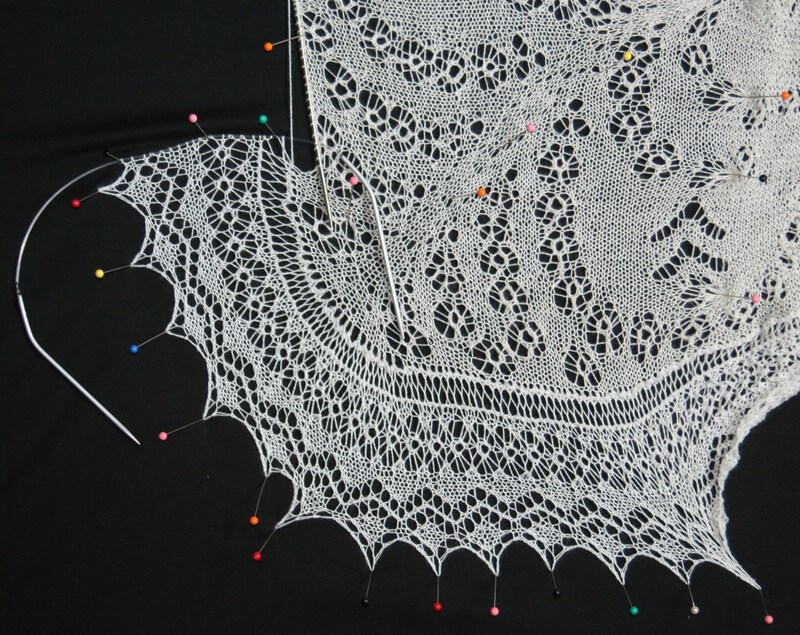 I decided on a bedspread rather than a shawl and so chose lace weight wool (1350m/100g) and 2.5mm circular needles. 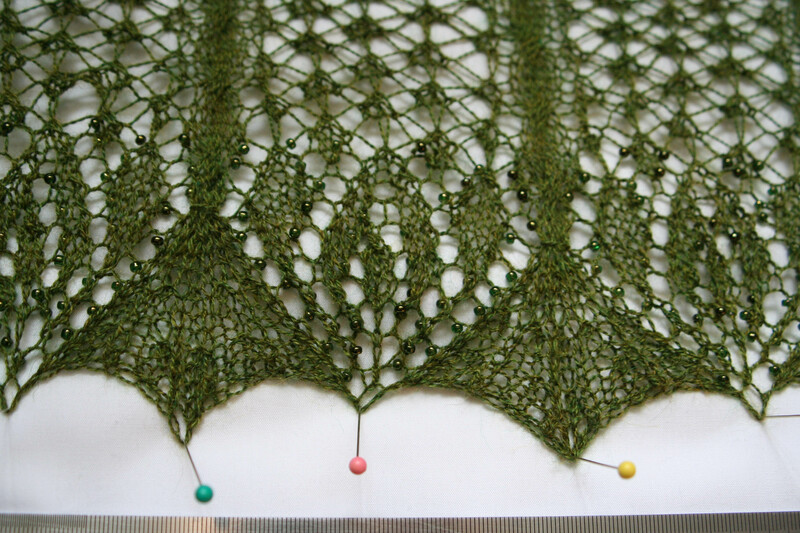 Gossamer weight is gorgeous, but it’s pretty fiddly and I just wasn’t in the mood! So I motored through the centre, because it’s real lace – no ‘rest’ rows – perfect for pain management! Then on to the border, in which every row is different. At this stage, the chart threatened to take over the living room, until I got it assembled. I figure out that I could prevent my eye from skipping up and down the chart rows by using different coloured highlighting pens as I went. The usual technique of hiding the unworked rows with an opaque ruler didn’t work very well, because the rows were too long! 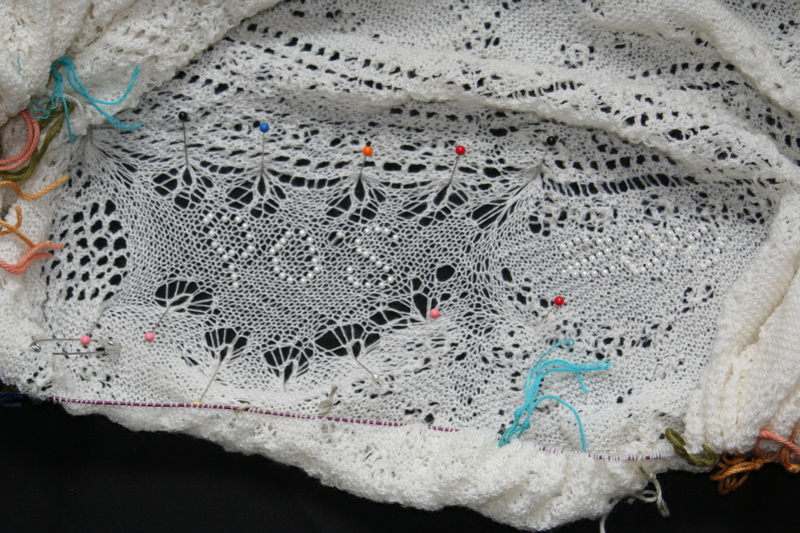 The border kept growing, I felt confident I’d be finished within the year, so I knit in my initials and 2010 with little pearl beads. I wanted to personalise as proof that I’d actually managed to knit it by my self! Then disaster struck in the form of moths. It was very possibly just one moth, but it chose the wrong place to have a snack. One tiny spot on my working ball of yarn was nibbled, only a few strands were severed, but who knew what further pests still lurked within the knitting itself? So poor Queen Susan was banished to the outer darkness of the freezer compartment. New projects were completed, new designs conceived. But today I finally found the nerve to spread her out and check her for damage, and so far so good! The most noticeable thing is that the wool has yellowed, but as long as the fabric stays intact when I block it, I’ll be happy enough. 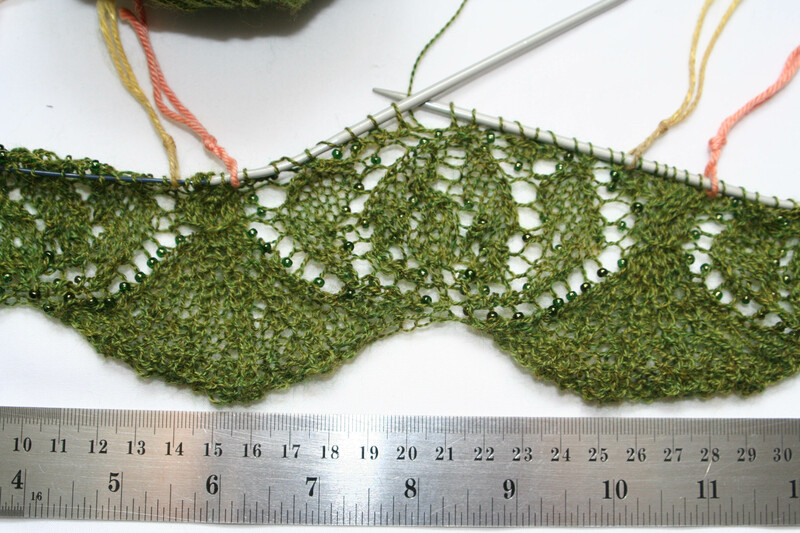 Mind you, I’ve still got three quarters of the edging to do, so it might be a while! 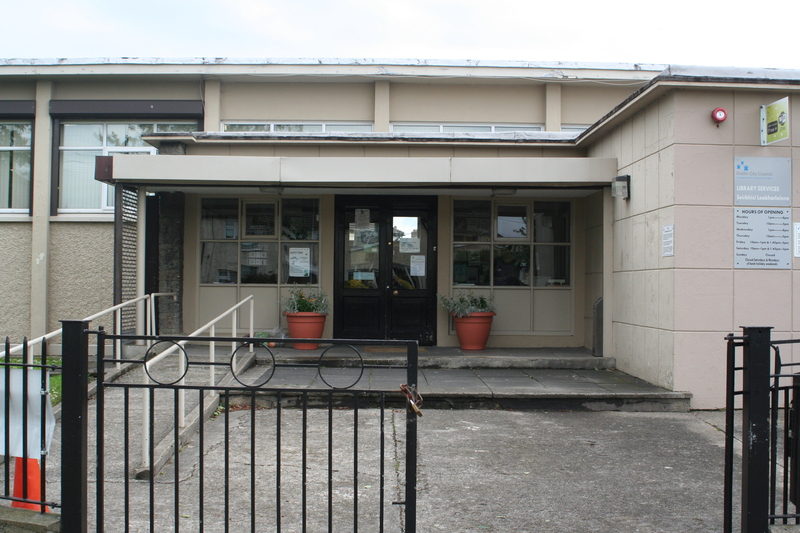 This is my beloved local library, in Walkinstown. This is where I regularly go to feed my book habit, and since April last year, to meet my knitting group. Back then the chief librarian was most hospitable when I suggested starting the group, and we’ve long since become a regular feature on Wednesday evenings. This year, I thought we might do something to cheer our venue up: the drab shades of grey and beige were crying out for a new look! 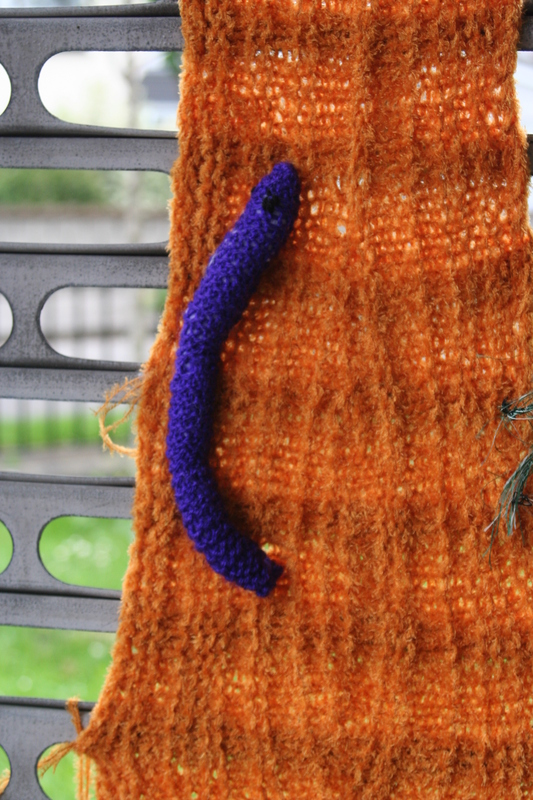 And what better time than Knit-in-Public-Day (June 9th)? 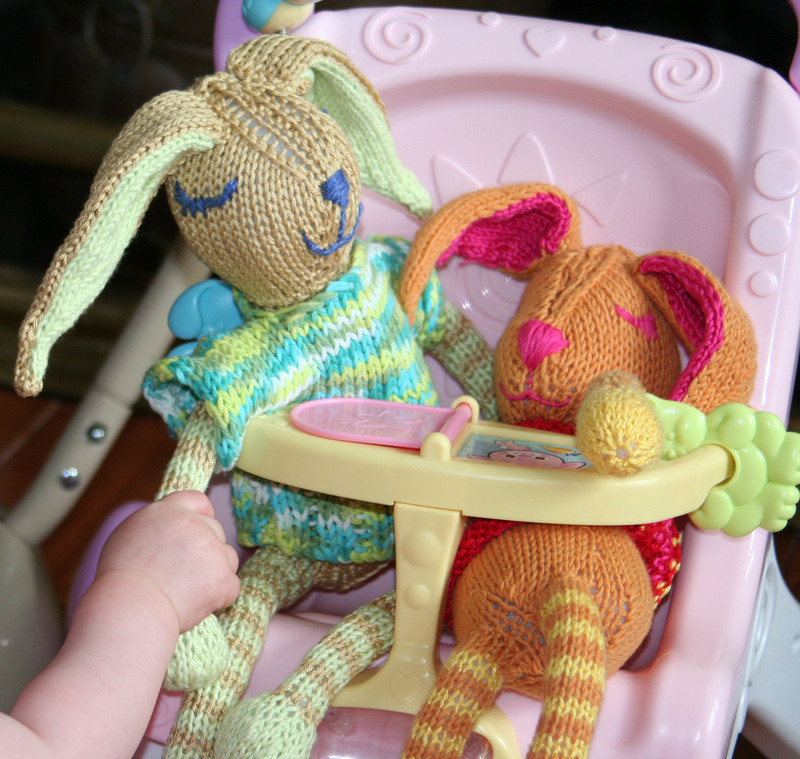 As about half the knitters are children, we needed to focus on a small area to decorate with items which could be made without complications. 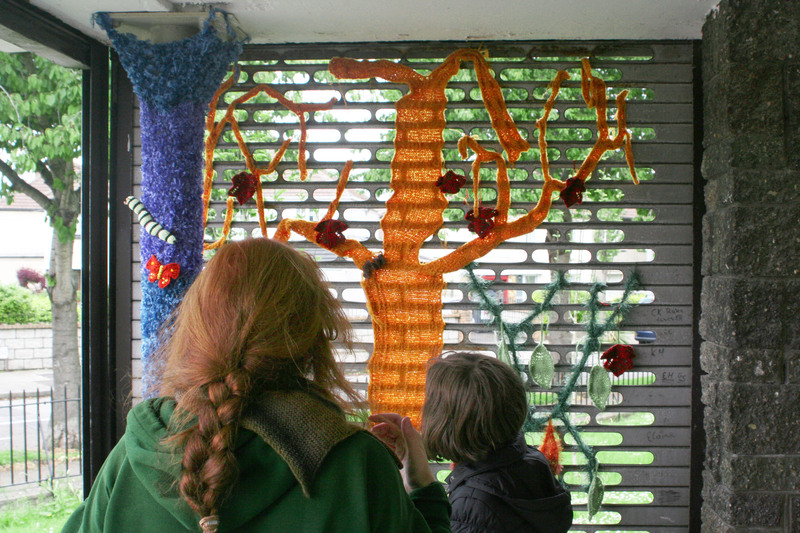 Our “Garden of Imagination” started with a skeletal orange tree. You have no idea how long I’d been waiting to find a use for that orange acrylic I’d bought on a mad impulse. 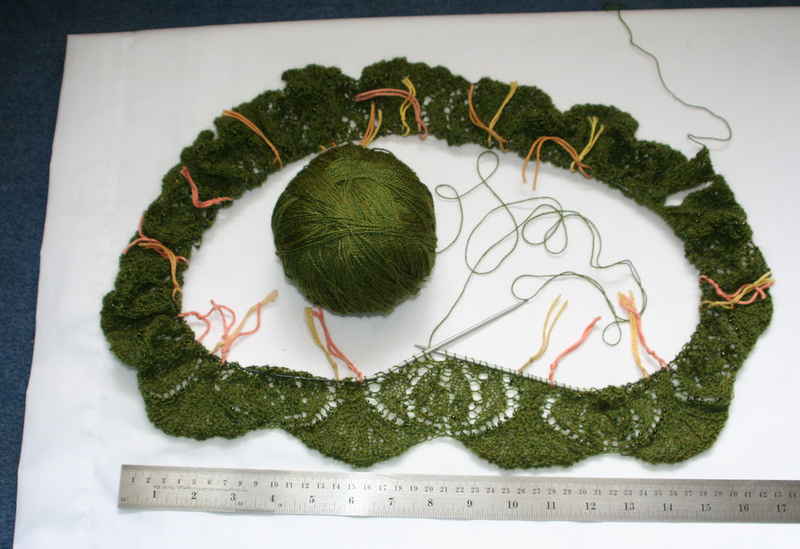 With that as a framework, flowers, leaves, butterflies and caterpillars started growing on our needles. I think everyone was surprised and delighted by the amount of creativity they were tapping into within themselves! We had only one rule (by personal request): no snakes allowed. So we have some suspiciously long and colourful worms, but no reptiles. Honest. 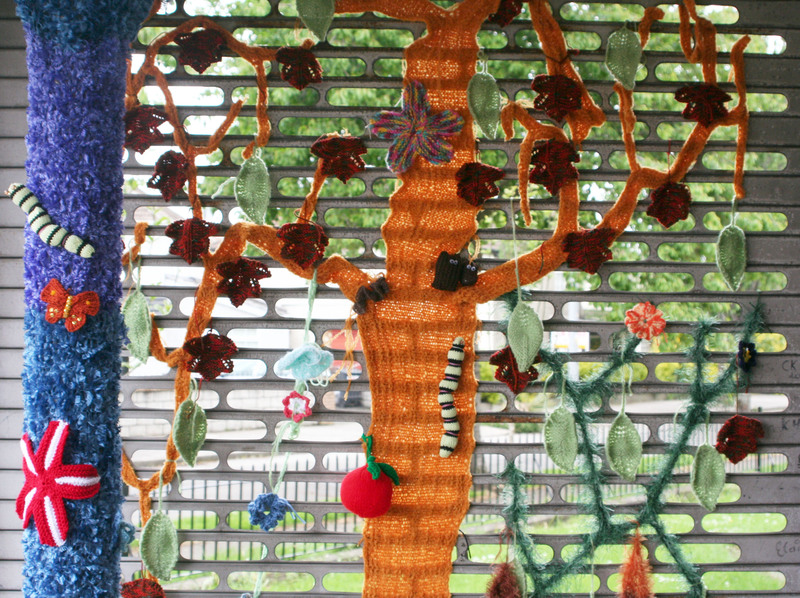 I had fun putting a few knots into the tree trunk with short rows. I used the wrap-and-turn method, which didn’t look too bad because the yarn is so fuzzy, but I have since learned about German short rows (thank you, knitty ’06!) and have been converted. All those years living in Germany and I never heard about that technique, but then, I don’t know many geologists who are knitters. 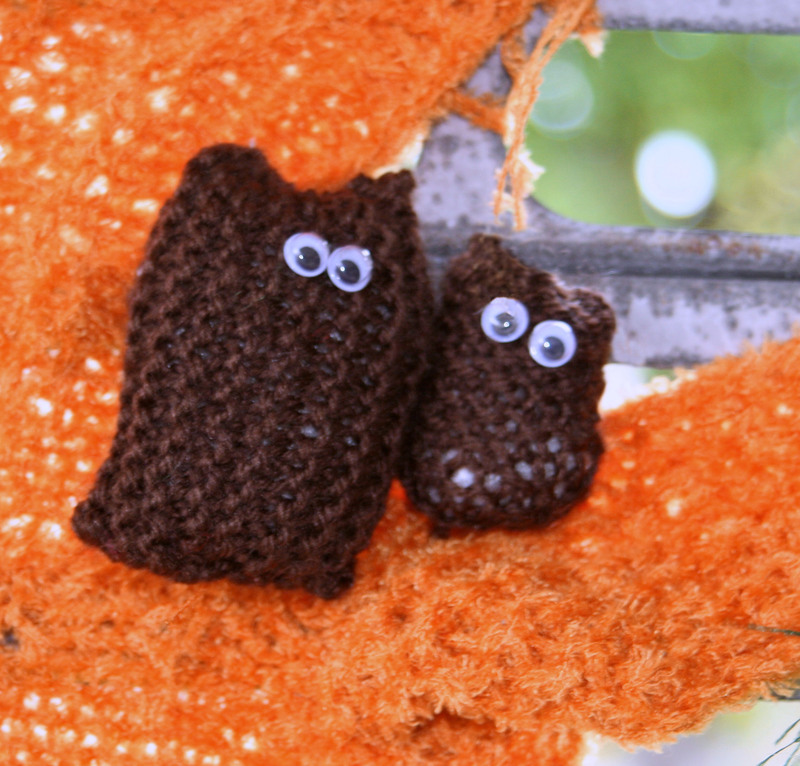 One of the many things I love about knitting is that there’s always something new to learn! This is me inspecting our work-in-progress with young L., who was actually just visiting but kindly stayed to help! 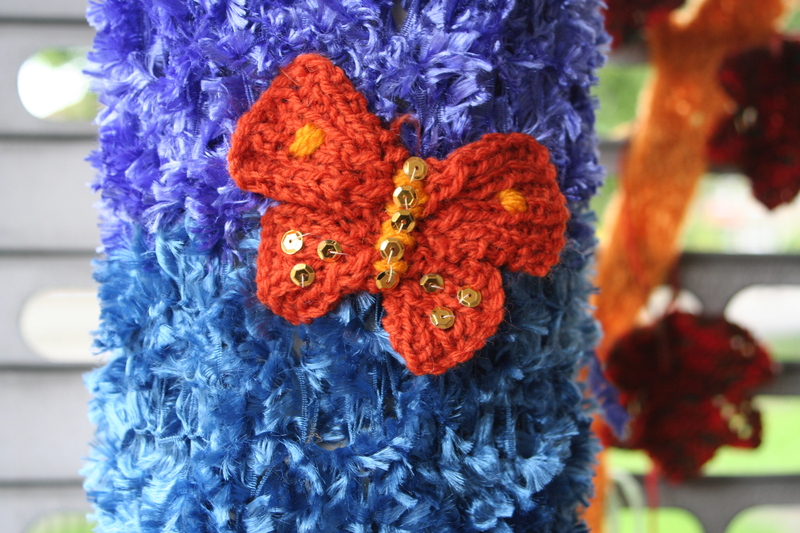 Butterflies were attracted to the bright colours! And the whole creation is still blooming and bringing smiles to peoples’ faces a month later!